“I have a deep love for peaches. I love their smell as they ripen, I love that they need to be consumed upon the sight of a bruise, I love how the yellows blend into deep reds, and I most of all, love their flavor and the versatility of using them in both sweet and savory dishes. Last September, I missed Michigan peach season by about seven days. I set out with my sister Elizabeth last weekend, happy in the knowledge that we were right in the midst of peach season. About two and a half hours north east of Chicago is one of the best microclimates in the Midwest for fruit, and I was determined to understand why. 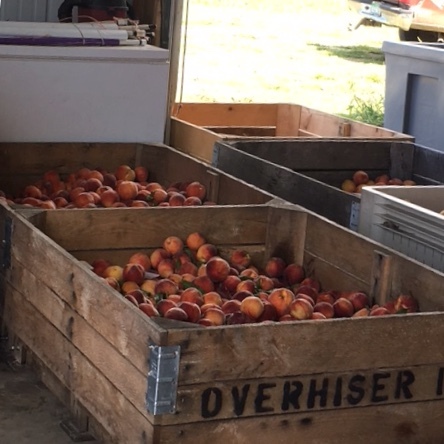 We pulled into Overhiser Orchards outside of South Haven, Michigan, and I was quite literally giddy with excitement. Overhiser has been in operation by the same family since 1863. As we drove towards the UPick orchards, our guide hinted at this connection to the land all the while conducting a lesson on my favorite late summer fruit: the varieties that were currently ripe (Flamin Fury #27, Baby Gold #7, and Louring specifically) the best harvesting techniques, and her personal favorite varieties for a seemingly endless list of peach recipes. I’m a firm believer in following the wisdom of a farmer’s advice whether I’m at the market or on the farm. Elizabeth and I opted to pick a blend of peaches that would satisfy my desire to make jam and also to eat peaches for any meal. Lucky for me, Elizabeth was totally content taste-testing our way through the 85F fields and was equally excited to help prepare and later reap the benefits of our peach bounty. Peaches are ready to harvest when they show no visible “green/yellow” skin and should be harvested by giving a gentle twist while holding onto the bottom to protect the fruit from dropping to the ground (which would inevitably bruise the delicate fruit). You can really tell the difference in taste in texture between the varieties. For example, the Flaming Fury was softball size “clingstone variety,” that has a pit that doesn’t separate from the fruit easily and, knowing that, I can understand why our guide compared it to a mango in taste and texture. To make jam, cut peaches into 1-inch pieces and place with sugar in a large bowl (this is a great task for smaller hands). Allow fruit to release juices for to 2-3 hours at room temperature, and finish up something else on your to do list! Set plate in the refrigerator to chill. Once the peaches are ready, transfer entire contents of bowl (you will notice it is already starting to look like jam!) into a large saute pan. Heat over high heat until mixture starts to simmer. Reduce to medium low and let fruit simmer and reduce. Make sure to periodically stir the peaches and strain off any white residue or foam from the surface into your ramekin or cup (this is the impurities from the fruit and will affect the taste and texture of your jam). The jam will cook for about 45 minutes to an hour in total. Meanwhile, zest lemon and juice lime and lemon. Set aside for use later, and cut lemon verbena into strips with scissors (another great task for a helper). Measure, prepare, and set aside other herbs and spices, is using. Once you start noticing your jam turn a deep orange and are straining less white foam, add the juices and lemon verbena. Let cook an additional five minutes and begin testing for completion (using that plate you have chilling in the fridge). Jam is done when a small portion wrinkles on a cold plate or otherwise holds its shape without spreading. If you aren’t sure, give it a couple minutes and test again (you can use the same plate as it is probably still very cold). During the testing process, assemble your canning station: wash jars and set aside on a clean towel, fill a stockpot with water and 3-4 jars, cover, and place on high heat, and place tongs and a kitchen towel on the counter next to your range. Once the water is boiling, set a timer for 15 minutes. If your jam is done, feel free to turn off. After the 15 minutes are up, remove jars and place on kitchen towel. Turn water down to a simmer and set lids and rings into water while you fill jars. Fill jars with a funnel and ladle, and make sure to leave about ½inch from the top. The jars need to be close to the temperature of the jam otherwise they will not seal correctly or will shatter the glass. Place the lids on, and twist the rings until you feel slight resistance. Place jars back in stockpot, and boil an additional 15 minutes (this seals the lids). Remove jars and set on towel, let cool slightly, and tighten the jars as much as possible. You might hear them pop, and that is a good sign as the jars are seal fully as they cool! Repeat with remaining jars. Check the jars the following day by flipping them to verify the seal will hold (a nerve-wracking test, but if I survived, you can too). Anything that isn’t sealed can go through the process again or be left in fridge for 2-3 weeks to enjoy on bread as I did here. Date and label the jars, and store in a cool, dry place. Depending on the lids you purchase and if you properly canned, your jam will be good for 12-18 months.